Pictured, from left, are Dan Woods, Alan Alderfer and Elim Smith. KOSCIUSKO — The Kosciusko County Alcoholic Beverage Board renewed two permits and approved a permit transfer for Oak and Alley during its meeting Thursday, Feb. 7. David Gustafson, representing Oak and Alley, 2308 E. Center St., Warsaw, was present at the meeting for the transfer. The business was also approved to change the transferred permit from a two-way to a three-way license, allowing the restaurant to serve beer, wine and liquor. Elizabeth Thompson, Mentone, was also present at the meeting regarding a permit transfer, but her case was continued to the board’s March meeting due to the need for further review. JST Solutions LLC, doing business as One Ten-A Craft Meatery, 110-112 N. Buffalo St., Warsaw. Beer, wine and liquor – riverfront. Orthocity Brewery and Smokehouse, 975 Warren St., Warsaw. Wine retailer – restaurant. 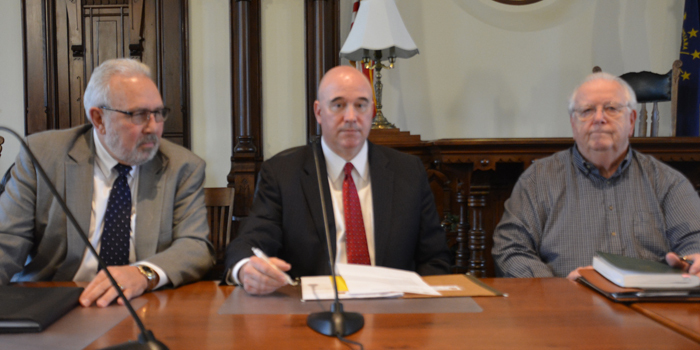 The board’s next meeting will take place at 1 p.m. Thursday, March 7, in the Kosciusko County courthouse.